We Update This Post Continuously. Interested in learning which social media platforms will work best for you? Facebook Live: I’m identifying this as a separate platform from Facebook, even though it’s not (hey, it’s my blog and I can do that if I want to). Facebook Live was created to compete against Meerkat (dead), Periscope, Houseparty, and Instagram stories (sort of). It’s taken the world by storm. Strengths: Wide adoption and ease of use. Weaknesses: Once you start squashing your competitors, humans are prone to root against you. Google+: The clean, simple interface makes connecting with friends, family and business associates a piece of cake. Google+ was the fastest-growing social network in history but it looks as though it has plateaued. (Read between the lines: It’s a ghost town.) Strengths: Ease-of-use and uncluttered environment. Weaknesses: Competition from other well-established social media platforms like Facebook. Houseparty: This is the app that has replaced Meerkat, which imploded (see below). The press kit on their website is just a bunch of images — no information on adoption or future plans. Will they become relevant in light of Facebook Live? Probably not. LinkedIn: This is the Grand Pooh-Bah of them all. They’ve been around since 2003, which, in social media terms is also known as “since the beginning of time.” I think LinkedIn succeeds despite itself, but others may disagree. Strengths: Everybody’s on LinkedIn. 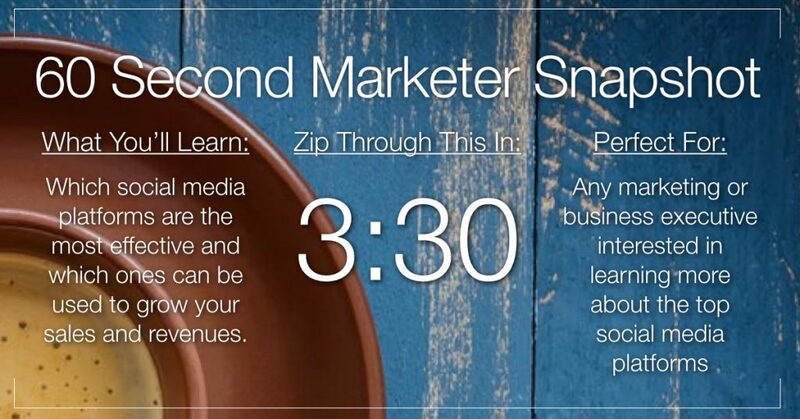 Weaknesses: Most people have trouble knowing what to do with LinkedIn after they upload their business information. Meerkat: Dead as a doornail. Bummer. These guys were the hero of SXSW a few years ago but imploded under all the pressure. Houseparty has risen out of the ashes, but I’m not sure it’s been widely adopted in the face of Facebook Live. Periscope: Like its close relative Meerkat, this new video sharing platform is taking the world by storm. Are you interested in using live video to share parts of your life with the world around you? If so, then Periscope is for you. Plaxo: Currently hosts address books for more than 40 million people. Helps people stay in touch with “Pulse,” which is a dashboard that lets you see what the people you know are sharing all over the web. Strengths: Graphical user interface makes it easy-to-use. Weaknesses: It’s not as widely adopted as some other platforms such as LinkedIn. Snapchat: Originally a sexting tool, Snapchat has evolved into a mainstream social media platform and, at one time, was the fastest-growing platform around. Things have slowed down a bit for Snapchat, but it’s still a formidable platform that will have a long shelf life. They currently define themselves as a “camera” company. Strengths: Wide and loyal adoption among a specific segment of the population (those under age 35). Weaknesses: They’re trying to diversify into some highly questionable arenas (glasses? really?). Twitter: Despite President Trump’s seeming obsession with Twitter, I believe that the best days for this platform are behind it. They were never really able to monetize or expand the platform (although I’m sure the folks at Twitter would disagree). Keep using it, keep playing with it, but don’t expect it to replace Facebook any time soon. Strengths: Used by large segments of the population. Weaknesses: Can be a distraction, especially if you have Attention Deficit Disor … wow, look at that bird outside my window! Bing: Bing, Google, and Yahoo aren’t technically social media platforms, but they are tools that can be used to promote your product or service, so we’re including all three in this overview. The technique for using any search engine to promote your product or service is the same so you’ll want to optimize your website so that the search engines see it. By doing so, you’ll drive traffic to your website from the people doing searches on specific topics. Strengths: Bing uses “intelligent search” to make searches even more relevant for the user. Weaknesses: It’s fighting against Google, which is a tough battle. Blogging Platforms: These are tools that are used to create blogs. Some of them, like Blogger, Tumblr, Vox or Xanga are straightforward platforms that are great for people who want to do a simple blog about their vacation, their company or their family reunion. If you’re ready to create a more robust blog that adds a lot of SEO value for your website, you’ll want to use Joomla, Drupal, Typepad or WordPress. These are the blogging platforms used by serious bloggers. Discussion Boards and Forums: Are you interested in creating an online forum where members of your community can engage with each other and offer each other advice? Then a discussion board or forum is for you. The best-known platforms for forums include Lefora, Zoho, Drupal, PhpBB, Vanila, JavaBB and vBulletin. Strengths: Forums are a great way to build a relationship with customers and prospects. Weaknesses: They require regular, ongoing time and energy to keep them running properly. 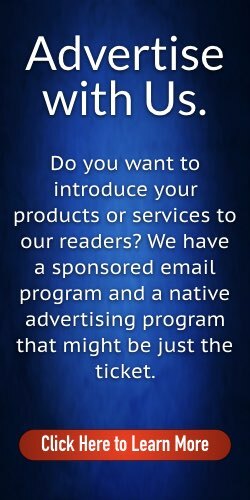 Email Marketing Platforms: Email can often get overlooked in the world of social media, but if you define social media as tools that help you have a dialogue with your customers and prospects, then email falls into the social media category. Popular email marketing tools include AWeber (affiliate link), Constant Contact, iContact, Marketing Cloud and GetResponse (Side Note: I’m friends with and work for the folks at GetResponse). Strengths: Email is a highly measurable way to connect with customers and prospects. Weaknesses: Email marketing requires a concerted, ongoing effort if you’re going to do it right. Yahoo: Like Google and Bing, this is not technically a social media platform. But it is a tool that ultimately can drive traffic to your website. Be sure to optimize your website so that search engines like Yahoo can see it. Strengths: Yahoo is one of the workhorses of the search engine world, so it’s always a good idea to keep it on your radar screen. Weaknesses: Is Yahoo a search engine? An online portal? A web magazine? Perhaps it’s all of these things. And perhaps that’s not a weakness after all. DashThis: This automated reporting tool is designed specifically for marketers to track and display their social media and web analytics KPIs. The reports are great for sharing with clients or marketing teams, and the tool is known for being simple to use, good-looking and for providing a legendary customer service. You can use the tool’s pre-built report templates or start one from scratch. Plus, one great thing to note with this tool is that you can add data from multiple social platforms into a single report. Geckoboard: Geckoboard is also a tool to report your data, and it was created specifically to showcase your dashboard on a TV in your office. Your sales or HR team could use it to showcase their own monthly results, but you can use it to showcase social media data from your different marketing integrations. It’s pretty cool to see your data in real-time, like how many people visit your Facebook or Twitter page every day, for example. Tableau: Tableau is a BI analytics platform you can use to analyse your marketing data. It has the advantage of being very customizable, and you can add all the data you want in your dashboard (social, sales, web analytics, or others). However, you might need help from your IT specialist to do so. There’s a bit of a steep learning curve, but once it’s all set up and you understand how it works, you can get very thorough marketing data with complex formulas and data correlations to have a deep understanding of your marketing results. Agorapulse: This is a social media management tool run by my good friend Emeric Ernoult (who, because he is French, is undoubtedly on a kitesurfing vacation right now). Emeric and his team have put together one of the fastest-growing social media management platforms on the planet. It’s highly intuitive and very robust. Check it out. And be sure to sign up for their blog, too. LocalVox: This is a social media dashboard that’s similar to HootSuite and TweetDeck. It’s perfect for people who are interested in drilling down a little deeper than either HootSuite or TweetDeck allow you to do. You wouldn’t want to use LocalVox in addition to the others, but instead of. If you need a more in-depth experience, LocalVox may be just what you need. Likeable Hub: This is a social media management and sharing platform created by my friend Dave Kerpen. You can access it via your desktop, or with an easy to use mobile app, so using it is a snap. Likeable Hub provides content creation, content scheduling, Facebook advertising (and amplification), website creation, analytics, and social listening tools. Overall, it’s a rock solid platform that’s perfect for busy professionals. Statusbrew: This is a comprehensive social media management tool that allows you to manage your multiple social media accounts from a single dashboard. The features like publishing, audience, listening, and reporting help you to schedule, grow, monitor and evaluate your social media efforts in most effective manner. MIX: Formerly known as StumbleUpon, MIX, is comparable to Digg, Delicious, and Reddit. When you rate a website that you like using MIX, it’s automatically shared with like-minded people. And, it helps you find great sites your friends recommend. Strengths: MIX helps spread your content to people not regularly exposed to your products and/or services. Weaknesses: Competes with several other well-established tools, like Digg, Delicious, and Reddit. TweetDeck: Whatever happened to TweetDeck? Oh, that’s right — Twitter bought them and ran them into the ground. Bummer. Like HootSuite, TweetDeck provides a way to track many of your social media channels on one dashboard. It can be a time-saver and a productivity-enhancer, assuming you’re not easily distracted. Strengths: It’s very easy to set-up and get started. Weaknesses: Like all dashboard tools, it can lead to distractions for employees who are easily … Whoa! Is that a fly on the ceiling or just a speck of dust? 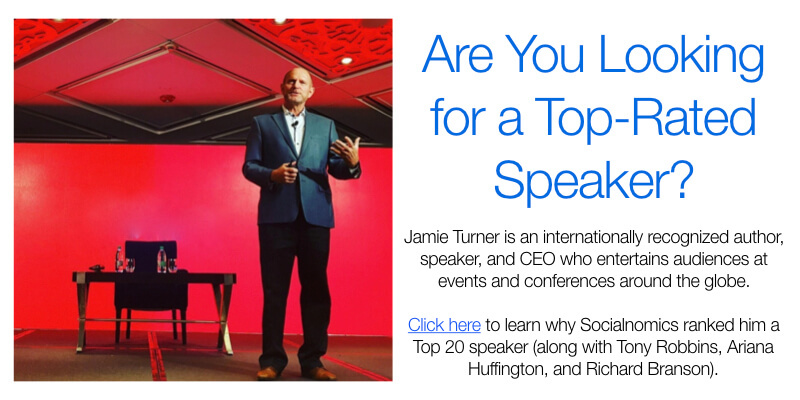 Jamie Turner is an internationally recognized author, speaker and CEO. He has been profiled in one of the world’s bestselling marketing textbooks, is the co-author of How to Make Money with Social Media, Go Mobile, and Digital Marketing Growth Hacks. 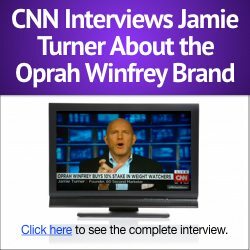 He is also a regular guest on network TV news programs such as CNN and HLN. 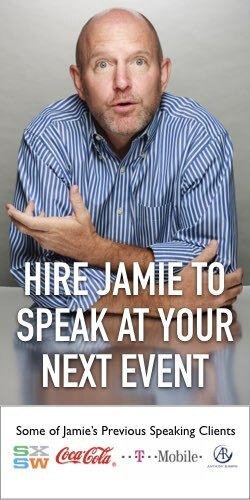 To learn more about hiring Jamie to speak at one of your events, visit JamieTurner.Live where you’ll find plenty of neat stuff (including video! ).